Many of our regulars are not able to come to our regularly scheduled storytime during the day because of school. So we have decided to try something a little different this fall and have an evening pajama storytime. The idea is the kids can come in with their pj’s and stuffed animals and enjoy a storytime right before bed. Of course, they don’t have to wear the pj’s however it is very cute when they do! Since this was our first week, I decided it would be best to have a to have a bedtime theme and read stories all about going to bed. There are so many awesome picture books on this theme, I am sure that I will be able to do in the future with completely different books. The first book we read is one of my favorite picture books, How Do Dinosaurs Say Goodnight by Jane Yolen and illustrated by Mark Teauge. This book is always a crowd pleaser. I have found it to work well for multiple age groups. The older kids enjoyed looking for the hidden dinosaur name on each page and the younger kids liked practicing their roars and discussing how they are good dinosaurs when they go to bed. 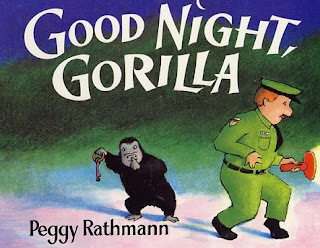 After that, we read Goodnight Gorilla by Peggy Rathman. I have always loved this quick bedtime book. The kids enjoyed saying good night to all of the animals and got a kick out of that silly gorilla. 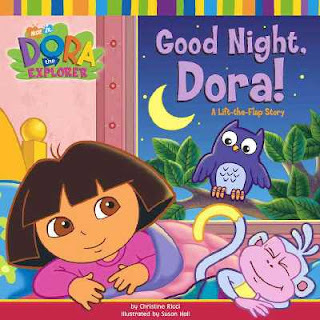 Next we read Good Night Dora by Christine Ricci. It was no surprise that this book went over really well with the kids. Dora is extremely popular so I knew that this book would be a exciting addition to pajama storytime. This is a lift the flap book an also has a bit of Spanish in it. My Spanish skills are pathetically poor so I had to rely on the kids to help me with the pronunciation. I think they really enjoyed that. 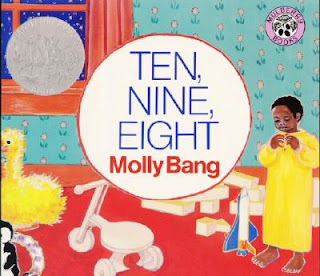 Next we read Molly Bang’s Ten, Nine, Eight. I think that the parents enjoyed this book a bit more than the kids. Even so, I have always found this book to be a good way to calm a group down and after the Dora book, that is exactly what we needed. 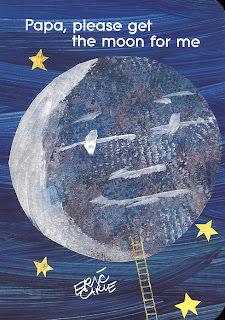 Finally, we read Papa Please Get the Moon For Me by Eric Carle. I love this book and it was a lot of fun for the kids. Eric Carle is one of my favorite illustrators. His books are a lot of fun to use in storytime because they always stretch the young one’s imaginations In this book, it is the pull out pages that make it extra fun. No one could believe how long the ladder the ladder Monica’s father used was! This book was a fantastic way to finish our first pajama storytime! Last week when I was helping a child look for a book, I came across a book I wanted to include in storytime. 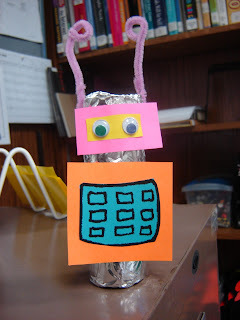 So, I decided I had to find a way to incorporate this book into this week’s storytime and what better way than to have a robot theme! 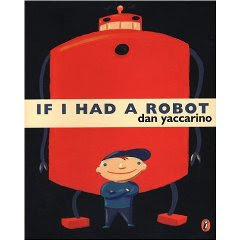 The first book we read was the book that made me want to do this robot storytime, If I Had A Robot by Dan Yaccarino. I am a huge fan of Yaccrino’s illustrations. I love his Oswald books which I am sure I will be using in a storytime soon. Anyway, If I Had A Robots a great book for storytime. After reading this book we had a little discussion about all of the things we would like our robots to do if we had them. 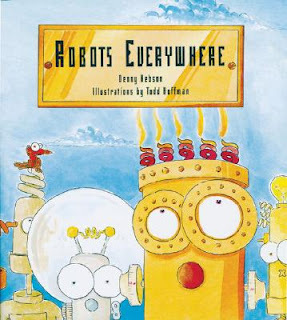 Next we read Robots Everywhere by Denny Hebson Illustrated by Todd Hoffman. This is great for younger kids because the text is fairly sparse however, the older kids enjoyed it as well because we talked about the similarities between the robot world in the book and our world. The kids really got a kick out of these robots. We finished this week with Little Robots by Mike Brownlow. This book was a nice end for our storytime today. It has nice and bright colors and cute rhymes, a guaranteed crowd pleaser! http://www.enchantedlearning.com/crafts/tproll/robot/ It took a little bit of help from their parents to get all of the pieces together but everyone was very satisfied with the finished product. Who can resist such a cute robot? A few of my regulars start Kindergarten next week so in preparation, we did a back to school storytime! 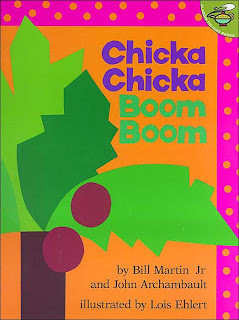 We started with Chicka Chika Boom Boom by Bill Martin Jr. and John Archambault illustrated by Lois Ehlert. This book is extremely popular with the kids in my library, its circulation rate is through the roof. My storytime friends really enjoyed pointing out the different letters and especially enjoyed all of the different injuries suffered by the letters after they fell off the coconut tree. The vibrant and silly pictures are always a huge hit with the kids. Next we read Minerva Louise At School by Janet Morgan Stoeke. This book may have been a bit much for the younger kids but the older children enjoyed Minerva Louise as she mistakenly identified different things in the school. They were very proud when they were able to identify the items correctly. Next we read School Bus by Donald Crews. Although I think this is a great book, I don’t think that the kids enjoyed it as much as I hoped they would. I think part of the problem may have been that only a few of the children actually ride school buses to school so they are not as familiar with them. 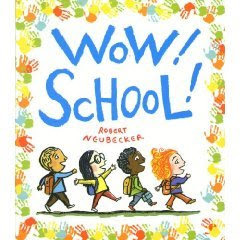 We finished with Wow School! by Robert Neubecker. Although this isn’t a very text heavy book the pictures are absolutely fantastic. Much like his other books, Wow City! and Wow America! this book has bright and colorful pictures that fill each page. The kids couldn’t get enough of them. A few of my regulars are huge truck fans and have been requesting a truck storytime for a while so I decided today was the day to make it happpen. I am a big fan of Jez Alborough. His rhyming stories are always a fun addition to any storytime. 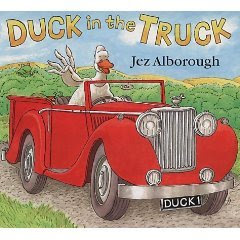 This week, I started with his book,Duck in the Truck The kids loved this quirky story about Duck and his friends Frog, Sheep and Goat who go to great lengths to remove Duck’s truck from the muck. This book proved to be a great way to start out storytime. It is a fantastic attention grabber and very silly story. 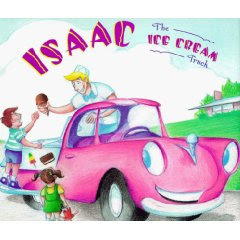 Next we read about my favorite kind of truck, an ice cream truck in Isaac the Ice Cream Truck by Scott Santoro. This is a sweet story about an ice cream truck who doesn’t feel like he is as important as all of the other trucks. However, he realizes that bringing people happiness is just as important if not more important than the jobs of the other trucks. The kids, especially the truck lovers, had a fun time identifying each of the different kinds of trucks. This is an older book and isn’t in print anymore. I interlibrary loaned it and liked reading it so much that I wanted to order it for our library. Unfortunately, it is out of print. We finished up with Matthew’s Truck by Katherine Ayres and illustrated by Hideko Takahashi. This book appealed to the younger kids in the group and was probably a bit too easy for the older kids. Luckily, because it isn’t too long, it didn’t cause much of an issue. It was a nice quick way to end before craft time. 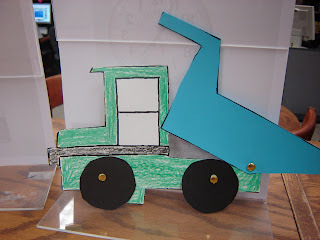 This week’s craft was really fun, we made dump trucks! 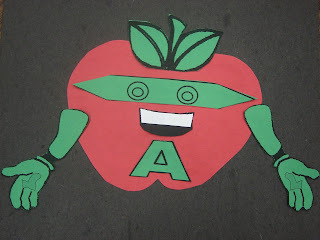 The template for this craft can be found here: http://www.thebestkidsbooksite.com/craftdetails3.cfm?CraftID=197 This website has a lot of great craft ideas. The group that comes to storytime has quite an age range, between 2 and 7 years old, which makes planning a storytime and craft suitable for everybody really difficult. It has to be easy enough for the younger kids and fun enough to keep the older kid’s attention. This craft seemed to be a good compromise. While the little ones needed a bit of help from their parents for this craft in the assembly, everyone had a great time! 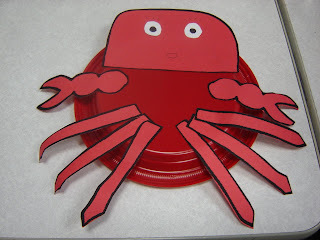 For storytime this week we took a trip under the sea! We explored three fantastic books all about sea creatures. We started with A Home for Hermit Crab by Eric Carle. 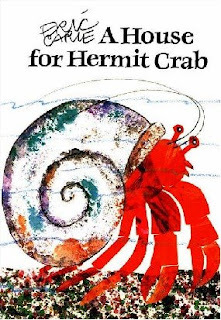 This is the fun story of a hermit crab who has grown out of his home and is looking for a new home. When he finds his new home he needs to make it feel more homey. Overall, it seemed that the kids enjoyed it however it didn’t have as great a reception as some of Carle’s other books that I have shared with them in the past. After that, we explored Swimmy by Leo Lionni. One of my all time favorites, Swimmy is about a brave fish who overcomes fear after losing his brothers and sisters and teaches another group of fish how to swim together and scare the big fish. 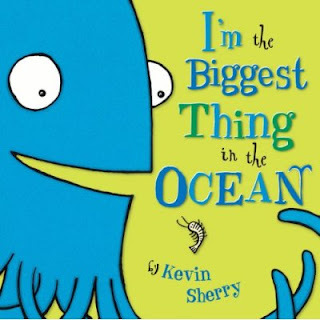 We closed up with another favorite, I’m the Biggest Thing in the Ocean by Kevin Sherry. This was, by far the most popular selection for today. The kids had a blast identifying each of the smaller things in the ocean such as shrimp and the scary shark. We continued to work on our songs this week. It seems that most of the children have had very little exposure to many songs and stretchers. Head Shoulders Knees and Toes was a huge success and I am going to continue to introduce physical songs into our repertoire. Instead of using bowls, we used red plates. It also provided a great opportunity to use googly eyes, always a crowd pleaser!